HomeCallan – Call Me Sir! Callan – Call Me Sir! Callan is tired of being a field operative and wants a desk job – he tells Hunter that he’ll do anything. But he’s not expecting to be offered Hunter’s own job …. Call Me Sir! certainly shakes up Callan‘s format and has the potential to move the series into new and interesting areas. Although it might seem strange that the position of Hunter was offered to the anti-authority, anti-establishment Callan, on the other hand it makes perfect sense – poacher turned gamekeeper, as it were. The moment when Hunter offers Callan the job is electrifying. Hunter invites Callan into his office and asks him to sit down. Callan looks around in confusion as the only free chair is Hunter’s own, but after a few beats he understands. It takes some coaxing to get him into the chair though, as it’s much more to Callan than just a piece of furniture – it’s an object that (along with its occupants, of course) has dominated his adult life. But eventually Callan takes the job and it’s instructive to see how he then interacts with the other members of the Section. In many ways it’s no different from anybody who’s suddenly promoted – the reaction he gets is a mixture of awkwardness and resentment. The awkwardness is highlighted by his relationship with Liz. In That’ll Be The Day Liz was tearful at Callan’s mock funeral and later warmly welcomed him back from the dead. Here, things start promisingly enough as she decorates his office with fresh flowers, but Callan oversteps the mark by asking her to call him David, rather than Hunter, when they’re alone. It’s plain from the expression on her face that this upsets the ultra-professional Liz and is responsible for a temporary chill in their relationship – highlighted by the fact that when the flowers die they aren’t replaced. But if there’s faint unease between Callan and Liz, it’s nothing compared to how Cross takes the news of Callan’s elevation. During the first two series, Callan and Meres were presented as equals – in age and ability (the only difference being that Meres lacked any sort of conscience). When Anthony Valentine was unavailable for series three, Patrick Mower was introduced as Cross. As previously touched upon, Cross is younger and much more inexperienced than Callan – so they’ve never been on the same level (this was highlighted by the fact that during the later part of the previous series Callan would regularly use Cross’ first-name whilst Cross still referred to Callan as Mr Callan). Callan’s sudden and unexpected promotion has simply widened the gulf between them and the older man wastes no time in establishing his authority. 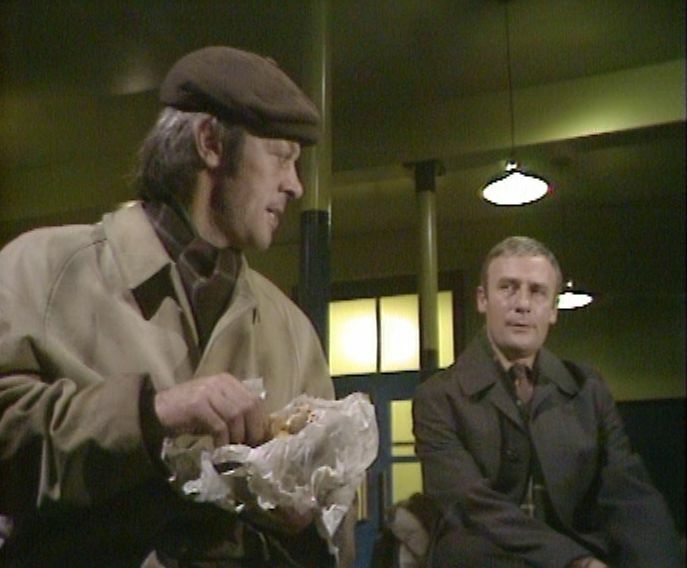 When Cross meets Callan as Hunter for the first time, he immediately sits down only to be told by Callan that he hasn’t been given permission! There then follows a brief battle of wills which Callan naturally wins – forcing the younger man to accept the situation and show the necessary respect (including calling him Sir, which Cross does through gritted teeth). With Callan now promoted, he’s in an ideal position to protect his friend Lonely. But there are various forces moving against the smelly little man and in a rather convoluted part of the story Callan elects to furnish him with a new identity and send him out of the country as a merchant seaman. Lonely’s far from keen, but Callan tells him it’s for his own safety. Lonely’s being hunted by the Section because he was put in a Red File during the previous episode (as he didn’t believe that Callan was dead). Now that Callan’s back (and he’s got the position of Hunter) it would seem logical for Callan to take Lonely out of the Red File. He could do it – he has the authority – so why didn’t he? It’s a part of the story that doesn’t make a great deal of sense. As so often, the interaction between Edward Woodward and Russell Hunter is highly entertaining. Lonely is now convinced that Callan’s a spy – but he believes he’s working for the Russians! The scenes between the pair of them at the doss house (where Lonely is hiding out) are first rate. Earlier, we see that Lonely has made the acquaintance of Flo Mayhew (Sarah Lawson) who tells him that there’s something fascinating about his face and elects to paint him (with his clothes on, thankfully). Her painting perfectly captures him in all his glory and Callan’s expression when he sees it is priceless. But it turns out that Flo is a member of the opposition and has ensnared Lonely in order to draw Callan out. This is another part of the story that feels a little contrived and over-complicated. Flo is captured and led away and it’s assumed that, like Richmond, we’ll never see her again. But as with Richmond, she does return much later in the series to haunt Callan …..
Bill Craig’s first script for the series had been The Same Trick Twice back in series three and this clearly impressed since he ended up penning four stories during the fourth series. He was always a very dependable writer, and although I have a few quibbles with parts of the plot, Call Me Sir! is a very strong episode.